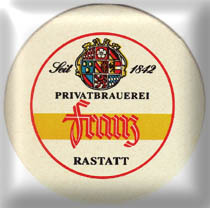 Two breweries worth visiting in and around Rastatt are Brauerei C. Franz established in 1842 which is found in the Rauentaler Str. 4, 76437 Rastatt, Tel: 07222/3 20 03, Fax: 07222/3 20 05. An attractive old brewery building where unfortunately you can only try their beers during special festivities. 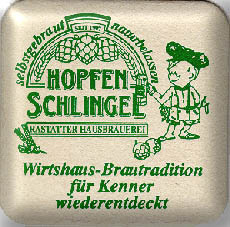 Widely available at pubs in town, try their Freiheitsbier and Dunkles. 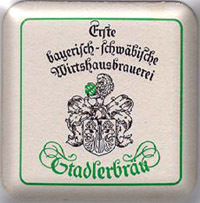 The Freiheitsbier seems to have been discontinued (2014). 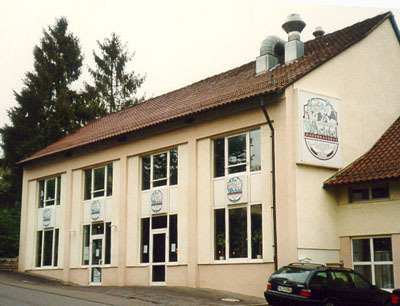 The HopfenSchlingel brewery from Pforzheim also opened another location in 1997 in the Militär strasse 2, 76437 Rastatt, Tel: 07222 30099. Open from 16:00 to 1:00 Monday to Saturday and from 16:00 to 24:00 on Sunday the large modern bar serves the same beers as in Pforzheim. As in Pforzheim the Pils is very ordinary and the brewery does not offer many speciality beers except for limited periods in winter. 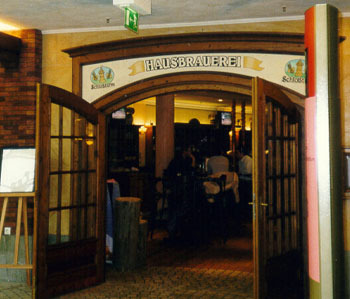 The Weizen beer is a very good example of its type which makes this brewery ideal for summer drinking as they have a large outside drinking area. The very limited Website has unfortunately little or no info about their beers. 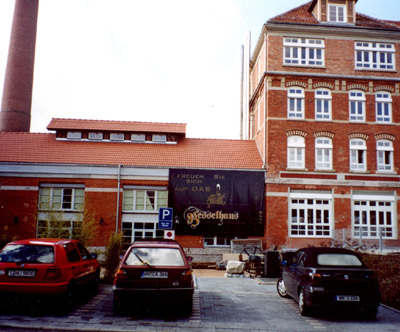 There also used to be a large brewery in Rastatt called Hofbrauhaus Hatz (now defunct and fused with the Moninger Brewery in Karlsruhe). Travelling south from Rastatt is the town of Gaggenau which is just to the north of the famous casino city of Baden Baden. 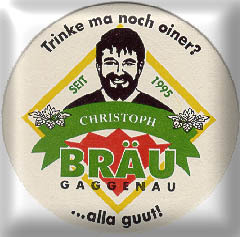 If you have any money left and are feeling thirsty you could visit a brewpub called Christoph Bräu which was founded in 1995. The pub can be found on the west side of the river a short walk from the centre of Gaggenau in the Alois Degler strasse 3, Tel: 07225 70393, Fax: 07225 3479. A modern new building with large glass windows and an open plan bar area affords views of the brewery copper kettles situated in the back corner. An interesting solid granite sink can be found in the WC. Reasonably priced food is available from chips to steaks. The Pils is a fairly ordinary beer of its type, although unfiltered it is quite clear and tastes a little thin compared with that of other breweries. The Rauchbier tries to copy the style from the Bamberg Schlenkerla brewery and although a fine beer it lacks the character of the original. The smoked taste is achieved by kilning the malt over a beechwood fire and if Bamberg is too far to travel the Rauchbier of the Vogel Bräu in Karlsruhe is probably the best of the rest. The beers are lagered for 4 to 6 weeks and can be taken home in 2 litre containers. The brewery also makes its own bierbrand a 38% strong schnapps made from their own beer and has its own Website. Recent visits showed that unfortunately little or no progress has been made with the beer quality and the bar staff showed very limited interest or ability in identifying which beers were available. As the place was completely empty perhaps the customers have also decided to vote with their feet and go elsewhere !. 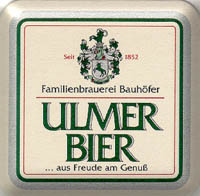 The medium sized but family owned Ulmer brewery founded in 1852 can be found in the small village of Renchen-Ulm between Baden Baden and Freiburg, and is well worth seeking out as one of the few breweries left which tries hard to retain its traditional values. 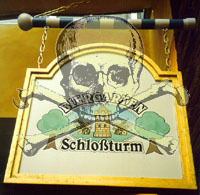 You will know that you are in the right place when you see the following welcoming plaque at the entrance to the town. 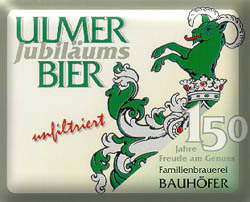 Ulmer beers should be tried at the Bauhöfer's Braustüb'l situated right next to the brewery at Ullenburgstrasse 16, 77871 Renchen-Ulm, Tel: 07843 695. The Braustüb'l which was built in 1929 when the next door brewery was modernised is very welcoming inside and also has one of the oldest beer gardens in Baden. Open every day from 10:00 except for Thursdays, a wide range of beers are available some of which are seasonal. Beer tasting should commence with the very refreshing flavoursome Export (12.9 % Stammwürze, 5.4 Vol. % Alcohol, 26 units of bitterness) which is still served in half liter stone mugs and is as good an example of this beerstyle as you will find anywhere in the area. A special Jubiläums beer to celebrate the 150th anniversary of the brewery is also available which is slightly more malty but less smooth than the export. Unusually the brewery also produces a Maibock which is available year round and is also served in stone mugs. This is a very pale beer (17.2 % Stammwürze, 7.2 Vol. % Alcohol, 38 units of bitterness) which is pleasant with a slightly sweet aftertaste and its strength is deceptive. Another special brew is the smooth dark (12.8 % Stammwürze, 5.2 Vol. % Alcohol, 18 units of bitterness) Vollmond (Full Moon) beer which uses Tettnanger hops and has a nice malty aroma. This beer can only be brewed (under licence) during full moon nights using specially produced natural raw materials and is therefore only available in limited quantities. Pils, Weizen and the excellent 7.5 Vol. % Alcohol seasonal Winterbock are also available at the Braustüb'l, so you will really need to make a couple of visits to appreciate the whole beer range. There is also plenty of choice when it comes to food (warm or cold) and the slab of Black Forest smoked ham which you have to cut up yourself is particularly recommended. 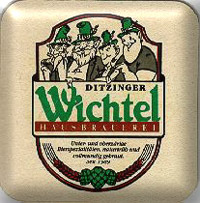 The Wichtel brewery is in the town of Ditzingen, another suburb of Stuttgart on the NW side and the address is Kornthaler Strasse 4, 71254 Ditzingen, Tel: 07156 5154. Established in 1989 and renovated in 2013 the brewery produces both top and bottom fermented beers with Pils and Hefe Weizen available year round. This very friendly and comfortable pub also makes an excellent Maibock which is exactly as Maibock should be. Unfiltered with a coppery colour the beer is full bodied, hoppy with a slightly harsh aftertaste and it is true to say that the Wichtel Brewery is one of only a few left which produce such a fine example. The only criticism would be that the beers are served very cold and especially for a Bock it is really necessary to wait a while before the true flavour comes out. An unusual type of food is also available called "Wichtel Cakes" which are Pizza like with different toppings and are very nice. The brewery sells its own T Shirts and it is also amusing to watch people who come into the main entrance and turn left as nearly everyone trips over the step even though there is a warning on the door. The brewery is open every day from 11:00. Also their Website has some English language options. 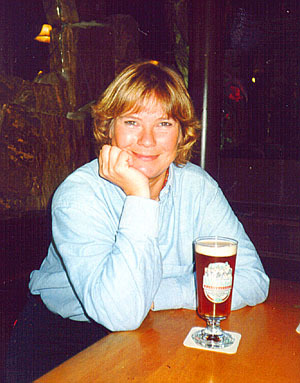 A second Wichtel brewpub opened in October 2002 can also be visited in the Stuttgarter Strasse 21 in 70469 Stuttgart-Feuerbach. Enjoying a nice Maibock ! To the north of Stuttgart and practically a suburb is the city of Ludwigsburg with its famous castle and porcelain museum. Two breweries are to be found within walking distance of the centre. 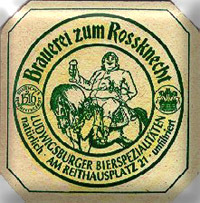 Within easy walking distance from the centre of Ludwigsburg the Rossknecht brewery can be found on the Reithausplatz 21, Tel: 07141 902551, Fax: 07141 922386. The brewery is 10 years old although the building is much older and there are a number of drinking areas within. Like the Calwer-Eck in Stuttgart this pub is justifiably very popular and is an essential stopping point for all lovers of great beer and good food. Beers include an Ur-Hell, a Munich style Weisse and speciality brews according to the season such as Dark and Light Bock, Rauchbier (Smoked Bamberg Style), Altböhmisches Schwarzbier and Maibock. The Maibock is one of the finest examples of this style of beer in the whole area and is hoppy, sweet and very smooth. Rossknecht can also be found at a 2nd location between Stuttgart & Heilbronn at: Hauptstraße 79, 74321 Bietigheim-Bissingen, Telefon 07142 / 913791, Fax 07142 / 913792. You will not want to go anywhere else after stopping off here. 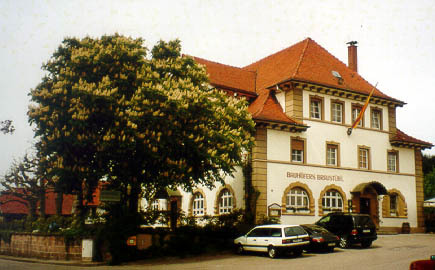 The Brauhaus am Solitudeplatz can be found at the back side of the building opposite the main station in the Bahnhof Strasse 17, 71638 Ludwigsburg, Tel: 07141 901767, Fax: 07141 902961. 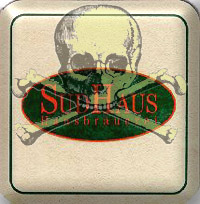 Formerly Sudhaus and Janke's Bierhaus the brewery has changed name (and owner?) but is still a good address for beer. A fairly basic beer hall type atmosphere and a young clientele means that there is plenty of life here. As for the beer there was only a hoppy pleasant unfiltered 11.8% Stammwürze and 4,7 Vol,% Alcohol Helles and a 12.5% Stammwürze and 5,2 Vol,% Alcohol Weizen when visited. No Maibock or other specialities were offered but this may change with time. Stuttgart is a busy city with plenty of brewing tradition and more than its fair share of brewpubs. It is home to the largest brewery in Baden Württemberg, which was formed after a 1996 merger between Dinkelacker and Schwaben Bräu. 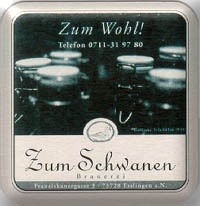 Actually in contrast to some of the brewing giants, Schwaben Bräu beers are quite good especially on draught. 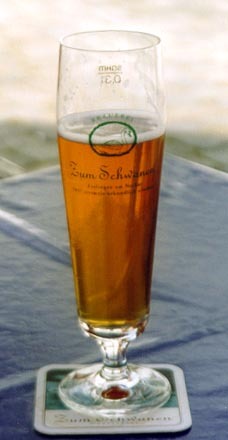 The 11.3 % Stammwürze, 5.0 Vol. 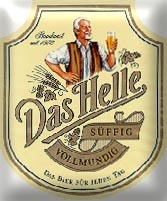 % Alcohol Helle is a pleasant well rounded, smooth beer with a good taste as long as you don't drink it too cold. 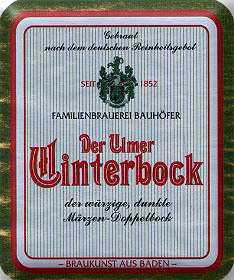 The 11.5 % Stammwürze, 4.9 Vol. 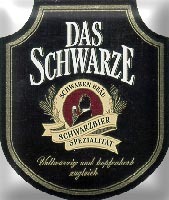 % Alcohol Schwarze is also a fine beer which has a dry "Alt beer" style aftertaste which has become more popular in Germany recently. Finally the 11.5 % Stammwürze, 4.9 Vol. 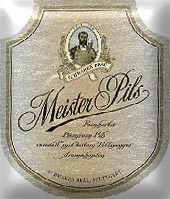 % Alcohol Meister Pils is also a good example of the style with a light hoppy bitterness. It is very encouraging to find at least one large brewery not allowing its products to descend into blandness for the sake of profits. Now on to the brewpubs. 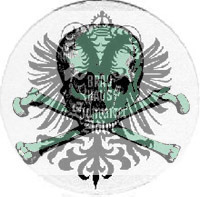 Lets start off with the now defunct Leonberger Brauhaus Schwarzer Adler (The Black Eagle). The Schwarzer Adler was situated in a suburb of Stuttgart called Leonberg on the Graf Ulrich Strasse 5 near the Marktplatz. 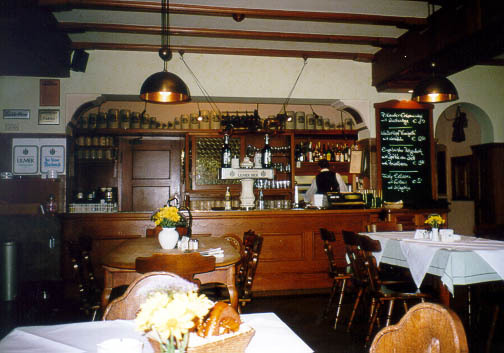 The brewpub was founded in 1993 and incorporated a large room with tables on different levels propped up by a false tree in the middle with a view on the brewing vessels. The beers shown below which were available were brewed with Hallertau hops and were fine if somewhat undistinguished. This brewery has unfortunately closed (Dec 98). 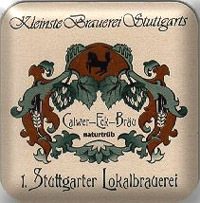 Another Brewpub in the Stuttgart region is situated by the busy main airport. 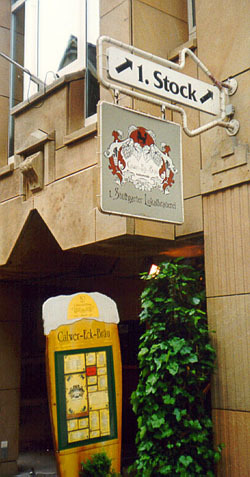 Formerly called Stadlerbräu the pub was renamed Schwanenbräu in 2004/2005. 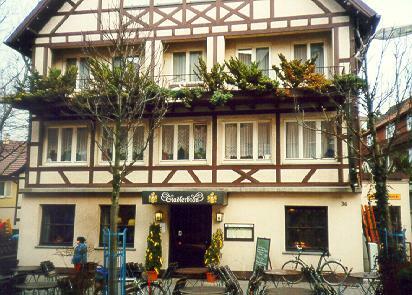 Originally calling itself the first Bavarian - Schwäbische home brewery, this pub can be found in Filderstadt Bernhausen on the Bernhäuser Hauptstrasse 36, Tel: 0711 706954, Fax: 0711 705156. 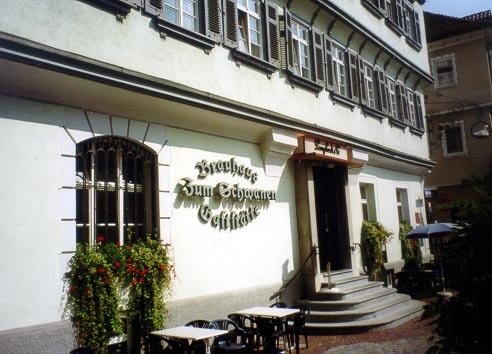 The brewery run by Rene Wiedenhöfer has existed since 1988 and is situated in the centre of town in a pedestrian precinct with space outside for tables in summer. The present beer range includes Pils, Weizen and a few seasonals. Originally the Pils and Weizen beers on tap were somewhat uninspiring but this has improved somewhat to accompany the name change. 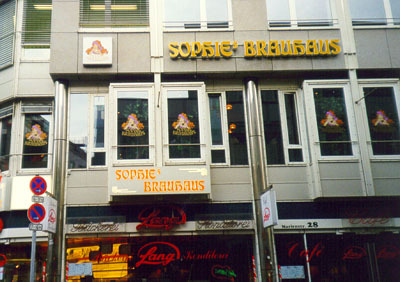 Sophi's Brauhaus is situated in the centre of Stuttgart in the Marien Strasse 28, Tel: 0711 610962. Occupying the first floor this well laid out brewpub is tastefully decorated with a central bar and has its own butcher which guarantees good quality meat products. The principal beer served is "Blonde Sophie" which is a Pils style beer and is quite dry and slightly overcarbonated. They also served a "SchwarzBier" in place of the usual Maibock provided by other breweries at the time of year visited (2nd May). This beer resembles very much the classical "AltBier" in style although not too dry. See the breweries own Website for more details. 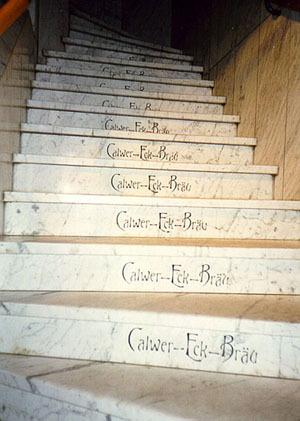 The Calwer-Eck-Bräu run by the Breitmayer Family was Stuttgarts first brewpub established in 1987 and can be found in the centre of the shopping area at Calwer Strasse 31, 70173 Stuttgart, Tel: 0711 222 49 44 - 0, Fax: 0711 222 49 44 – 22. Open Mo to Th from 09:00 to 1.00, Fr 09:00 to 02:00, Sa 10:00 to 02:00, Su 10:00 to 01:00 and public holidays from 17:00 to 01:00. The kitchen is always open until 23:30 serving Regional Schwäbische food. 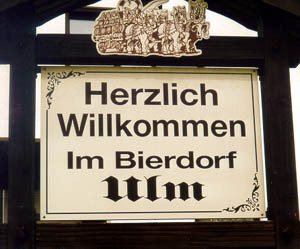 The brewery was supplied and installed by Luitpold von Bayern and the pub is usually very busy. The atmosphere is rather like an american brewpub with snacks such as Buffalo Wings available and pitchers of beer can be ordered. The beer is usually served here in 0.2 L glasses to guarantee always having a fresh product in front of you and the service is quick and friendly when you need a refill. 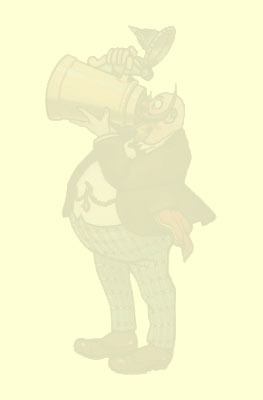 The beers are of excellent quality and one tastes immediately that the brewer knows his or her job very well. The main house beer is "Naturtrub" which is a fine refreshing slightly fruity unfiltered "Helles" type. The brewery also had a "Schwarzbier" on tap for the month of May and this has much more body and character than the one from "Sophi" with a wonderful aroma and taste of chocolate malt. 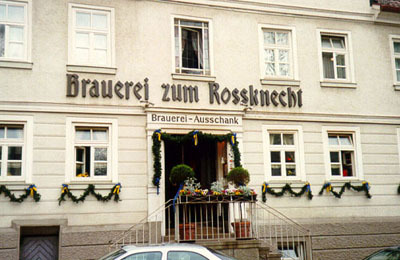 The brewery also serves a HefeWeizen and Bierschnaps. Definitely recommended for a visit when in Stuttgart. The Bräu in TUE-8, formerly known as the Stuttgarter Lok is basically now a mexican restaurant which only served Pils when visited. It is situated on the Tübingerstrasse 8, Tel: 0711 22366 and does not appear to want to advertise the fact that there is a brewery there at all. This brewery has now closed. This brewpub can be found outside of the centre of Stuttgart to the South and is situated in the SI-Centrum which is a large shopping complex with theatres. The exact address is Plieninger Strasse 101, Tel: 0711 63396640, Fax: 0711 63396641. The only house beer is "Schlossturm Pils" and a Weizen provided by the Tucher brewery. If you happen to be passing by, you could drop in for a drink but otherwise the beers from other breweries mentioned above offer a better choice. No mention of a brewery on the website anymore so probably ceased brewing. The Zum Schwanen brewery is located in the town of Esslingen, yet another suburb of Stuttgart in Franziskanergasse 3, 73728 Esslingen, Tel: 0711 353253 Fax: 0711 3508465. 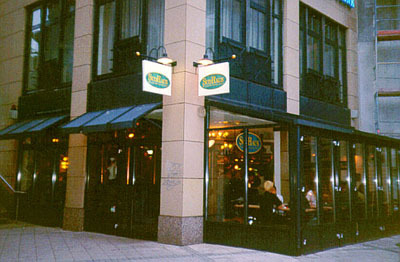 Established in 1987 the brewpub is open Monday to Friday from 11:30 to 14:30 and from 17:00 to 00:00. Weekend opening times are the same except for the evening where the pub is open from 17:30. Food can only be ordered until 22:00. Plenty of seating space is found in the beer cellar or outside in the beergarden just across the main road. Beers available include a dark amber 12.7 % Stammwürze Naturtrub Märzen which is smooth although a bit foamy and has a sweetish hoppy aroma which emerges as the beer warms up. Also available is a 12.5 % Stammwürze clean hoppy Pils which is served in nice elegant glasses as well as a classic Hefeweizen, prickly on the tongue with a good head and also served in nice glasses. All the beers are pleasant, brewed in a classic style without any particularly outstanding characteristics. A 17.7 % Stammwürze dark Bock should also be on tap from November. As for food try the nice creamy beersoup. Update 2015: Sadly seem to have relegated their beers to a lowly spot on the menu and no further mention of any speciality beers like Bock which may or may not be brewed. Parties, Clubbing and Livemusic events appear to have taken priority. 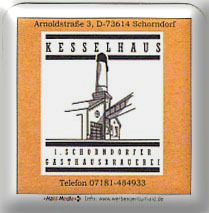 The Kesselhaus brewery can be found to the East of Stuttgart in the town of Schorndorf in Arnoldstr. 3, 73614 Schorndorf, Tel: 07181 484933. Situated in a new shopping and parking complex the area is nevertheless rather grim and uninspiring. Unfortunately the brewery does not really inspire either although the personnel are very welcoming and friendly. Pilsner and Weizen beers are usually available year round and both are quite drinkable although unexceptional. A dark Bock beer available around March has a good chocolate maltiness and is relatively bitter although slightly unharmonic overall. Merits a visit if you happen to be in the area. Bottom Ferented: Pils, Helles, Schorndorfer Spezial Märzenart, Schwarzbier, Starkbier, Dunkle Biere, Bockbiere, Rauchbier (rarely brewed). Top Fermented: Weizenbiere, Altbiere, Kölsch, Berliner Weisse, Bockbiere with Wheat Malt. Kesselhouse Brewery viewed from outside.